See also catalog # 530356 "Admiral Dewey Leading Land Parade" - Spanish American War United States High angle views of soldiers marching in parade with US and Red Cross after (or during) Spanish-American War. Closer view of reviewing stand - dignitary wearing top hats saluting. LS marching band in parade, followed by men on horses with plumed hats. Advance of Kansas Volunteers at Caloocan (1899) - Spanish American War Scenes This is a reenactment. 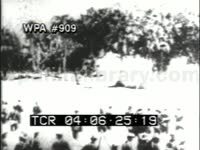 LS Cuban/Spanish soldiers standing in white uniforms, advancing through brush, shooting off rifles periodically which make a lot of smoke. Dramatic view of US soldiers waving flags, advancing on them -- the flag bearer falls, and Old Glory is picked up, and the troops move on. Battery K Siege Guns (1899) - Spanish American War New York, NY High angle parade with cannons and horses. 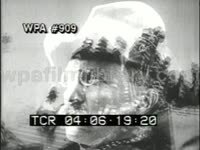 Title says Admiral Dewey homecoming, but poor condition of film makes faces impossible to read. 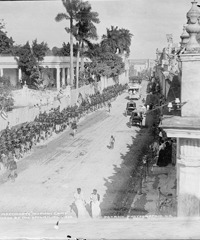 Burial of the 'Maine' Victims (1898) - Spanish American War Havana, Cuba Coaches pass slowly by, then hearses drawn by horses, men marching with them. Despite the condition of the film, the images here are haunting, just a few of the 260 killed in the blast. Capture of Trenches at Candaba (1899) - Spanish American War Scenes This is a reenactment. MS men firing rifles, lots of smoke. Dramatic if implausible view of old fashioned infantry warfeare. These appear to be Cuban soldiers, who are overrun by a group of US soldiers, one waving the flag with undying enthusiasm, even hitting his commander with the flagpole. One indication that thses are actors is thefact that as the commander's horse leaves the trench, we see him start to fall off. Cuban Ambush (1898) - Spanish American War Scenes This is a reenactment. 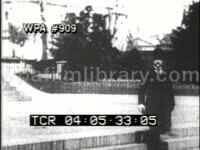 LS front of building, US soldiers walking past. Cuban soldiers pop out and begin shooting, and one falls out of the window -- carefully. Cuban Refugees Waiting for Rations (1898) - Spanish American War Scenes MS Cuban men, possibly POWs standing around by tent. Some women in the crowd too, possibly US volunteer workers. There is little action except for a few people walking around. Filipinos Retreat from Trenches (1899) - Spanish American War Scenes This is a reenactment. MS riflemen shooting from out of trench (actors). A few fall, then the others flee, and we see why, as US soldiers come over side and stand over dead Filipino soldiers. Governor Roosevelt and Staff (1902) - Spanish American War High angle parade with horses, decorated officers in plumed hats - pretty good views of faces here, including musicians on horses, and a soldier who gestures dramatically with a sword. Spanish American War - This is a reenactment. MS old man sitting on bed, then young soldier comes in - homecoming of soldier son. Father shakes his hand, then hugs him, and mother comes in and apparently faints. Younger brother plays with rifle, while a second woman collapses, sobbing. Another scene: Woman reading newspaper on bed, old man comes in with another paper and relays joyous news of some sort. Presumably a prior scene to the previous shot. LS (reenacted) firefight between US and Cuban soldiers, as seen before. MS two nurses outside tents, soldier on patrol, wounded man is brought in, and one woman kneels in prayer, then they carry wounded man into tent Another version of homecoming, joyous return of returning soldier. Packing Ammunition on Mules, Cuba - Spanish American War Scenes MS men carefully packing boxes of ammunition onto mule, officer or sergeant standing by. Rout of the Filipinos (1899) - Spanish American War Scenes Battle reenactment: slight slow motion views of white shirted soldiers backing up, firing rifles. US infantry moves in, firing and waving their hats. As Teddy Roosevelt himself might have observed, "Soldiers who wave their hats in the heat of battle are frequently known as casualties." Troops at Evacuation of Havana (1899) - Spanish American War MS men standing in courtyard of building, soldiers in distance marching by. 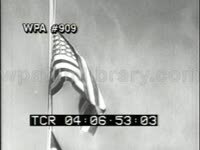 US flag waving. Closer view of procession shows US Army officer on horse, men marching. Good views of faces and waving flags as US soldiers pass. US Troops and Red Cross in the Trenches Before Caloocan (P.I.) 1899 - Spanish American War Scenes This is a reenactment. MS US soldiers in trench, firing their rifles under eye of offices, who waves his sword to urge them on - while looking at the camera several times for directions). Wounded man is taken away on stretcher, and Red Cross nurses tend to him and others in the trench. Wreck of the Battleship 'Maine' (1898) - Spanish American War WS harbor with ships, one a barge with a tower or derrick. This would be presumably to do with salvage or diving on the wreck. High angle views of soldiers marching in parade with US and Red Cross after (or during) Spanish-American War. Figures on hill behind waving handkerchiefs as they watch the parade with US and Red Cross after (or during) Spanish-American War. Battleship in harbor behind them. High angle views of soldiers marching in parade with US and Red Cross after (or during) Spanish-American War. Marching band in parade. Soldiers marching. Spanish-American War, 1898 TLS soldiers storming beach, explosions in trees. Rough Riders on parade in the States.